The financial services industry is a top target for sophisticated cyber criminals. Financial firms must take proactive steps to detect and prevent cyber attacks. Attacks on financial services firms are becoming more frequent and dangerous. A data breach leads to fines, lawsuits and loss of consumer confidence. Privilege management stops threats from reaching sensitive data and systems. The financial services industry has been a consistent top target for hackers. The historic data breach of JP Morgan Chase is not an isolated incident; cyber criminals launch attacks on banks and other financial firms every day, whether they know it or not. Most cyber attacks are not detected until consumers report identity theft, auditors find defects, or other third parties expose vulnerabilities. As financial services firms adopt IoT solutions, transition to the cloud, and manage big data, their systems become increasingly vulnerable to cyber attack. Security controls must keep pace with dynamic and complex threats. 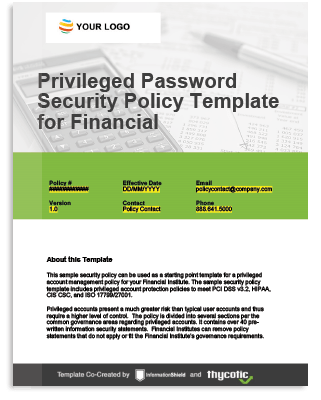 Financial institutions must have adequate security controls in place to protect privileged accounts – including administrative credentials, service and application accounts, and root accounts that control the most sensitive and critical systems. Financial firms need simple, scalable solutions to detect, manage and secure privileged accounts. I have used other solutions and most of them I did not like. I went looking for something that wasn’t them. Financial services companies must meet compliance requirements to maintain their charter, uphold the public trust, and avoid expensive fines. Make sure you have the required privilege management policies and controls in place to pass your next compliance audit and keep your sensitive data and systems safe and healthy.